There’s More to Sleep Care Than Snoring. Yes, snoring can be a disruption in the bedroom, and fixing it can do the work of a dozen marriage counselors. It’s time to recognize there’s a lot more to snoring that could keep you up at night. Sleep-related dental problems such as GERD (heartburn/acid reflux) and bruxism (teeth grinding) may be signs of more serious health risks including stroke, heart disease, arrhythmias and esophageal cancer. Plus, there are proven links between lack of sleep and a host of problematic symptoms including depression, memory loss, hypertension and weight gain. TAP Sleep Care from Airway Management effectively treats the full spectrum of sleep-disordered breathing, offering you a holistic, more intelligent approach to your well-being that can dramatically improve your quality of life. And now is the time to do it, with the introduction of dreamTAP – our newest, most innovative TAP Custom solution yet. An Introduction to Modern Sleep Care. So, what is TAP®? 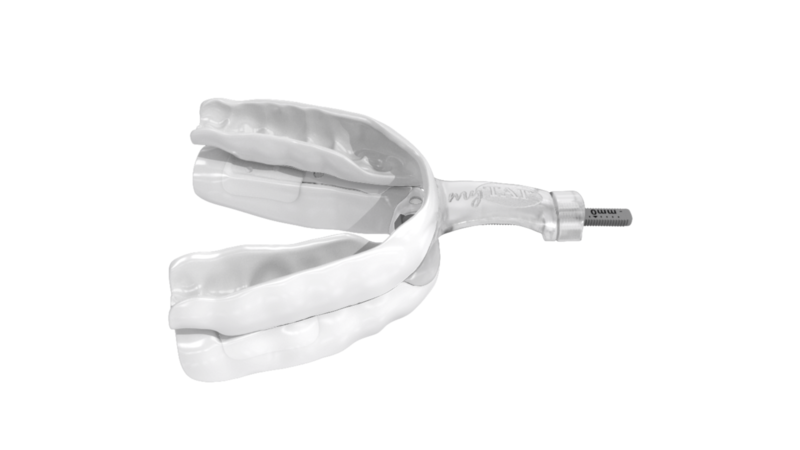 The Thornton Adjustable Positioner, or TAP, is a patented mandibular (lower jaw) advancement device specifically engineered for keeping your airway open during sleep. What makes the TAP so innovative is its single, midline tension mechanism. 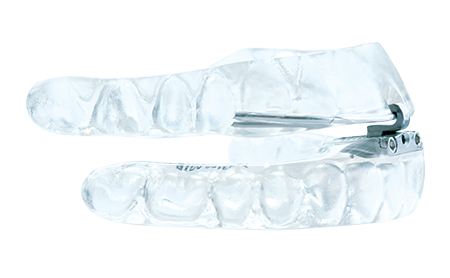 This technology not only allows you to advance your lower jaw with greater range than any other device, it also makes it incredibly comfortable and easy to adjust your device while it’s in your mouth. TAP Sleep Care lets you take ownership of your therapy by achieving optimal results on a gradual, night-by-night basis. You don’t have to just take our word for it – TAP has shown in numerous independent peer-reviewed studies to be superior and more effective than any other appliance on the market. In fact, it’s the only device proven to be equivalent to CPAP1. CPAP DOES NOT FIT ALL. Just like no two people are the same, no two sleep experiences are the same either. That’s why TAP Sleep Care is anything but a one-size-fits-all solution. Rather, it’s designed as a system of care with multiple treatment options. For a large number of patients, traditional CPAP therapy may not be the right solution. TAP Sleep Care helps your dentist or sleep physician develop an ongoing treatment plan that can benefit you the rest of your life, starting immediatelywith myTAP®, a precision-fit trial device that you can receive on your initial visit. IT’S TIME TO GET SERIOUS ABOUT SLEEP CARE. Unlike other so-called snoring solutions, we recognize that snoring is not a problem unto itself. TAP Sleep Care from Airway Management is a comprehensive approach backed by patient-centric science and 20 years of innovation to treat sleep-disordered breathing. The results speak for themselves, with more than half a million devices sold, and countless nights of better sleep. Find a dentist or physician near you who can treat your sleep-disordered breathing with TAP Sleep Care. If there is not a provider in your area, please have your primary dentist or physician contact us about providing you with a TAP Sleep Care product. TAP System devices are made in the U.S.A.
© 2015 Airway Management. TAP Sleep Care, TAP Screening, TAP System, TAP Method, TAP, TAP PAP, and myTAP are trademarks of Airway Technologies, LLC, registered in the U.S. and other countries. All rights reserved. From predictor appliance to custom solutions, the TAP System is a range of advanced devices covering the full spectrum of sleep-disordered breathing. Based on continuous improvement therapy, the TAP Method enables ongoing patient engagement supported by a disciplined method of testing, trial, titration and treatment.